Manuscript: C-7(p32-35) dated on the first page 22 Aug 1908 and on the third page 22 Aug.
After composing three vocal quartets on texts by Goethe (RC 85, 86, 87) for Gerard Zalsman’s ensemble of soloists within one week in August 1908, Diepenbrock resolved to set the poem Der Abend (The Evening) by Clemens Brentano for the same ensemble. The sketches date from 22 August, two days after the completion of Auf dem See (On the Lake). The thematic similarity between Brentano’s poem and Goethe’s Wandrers Nachtlied (Wanderer’s Night Song) will have motivated Diepenbrock’s choice of text. 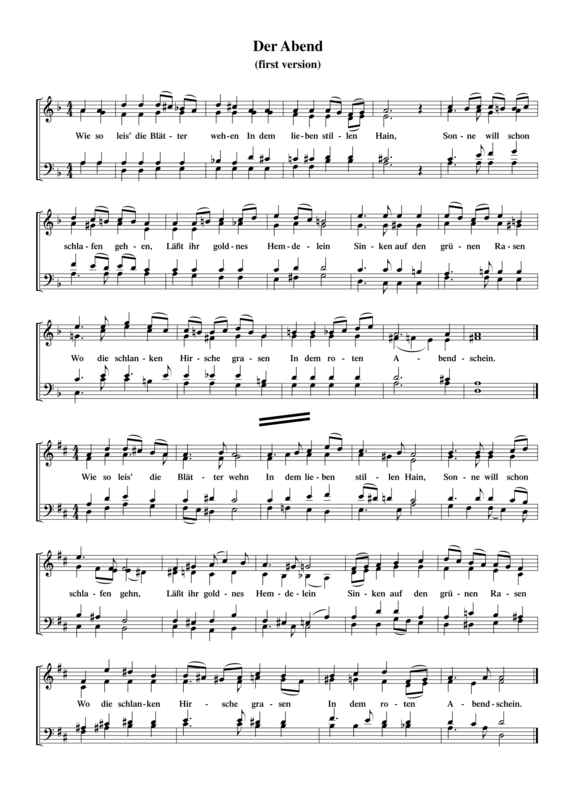 The composition got stuck after two different settings of the first verse, notated in 4/4 metre. The first is in d minor and its structure is determined by a peaceful progression of seconds. This version comprises 15½ measures. On a new page in the sketchbook Diepenbrock started another setting in D major that very same day, built on the opening motive in the soprano, but he also broke off this attempt after the first verse, which this time consists of fourteen measures. Clearly Diepenbrock was not pleased with either of these settings; he crossed out both of them with a thick blue pencil. Schlüpft hinein und wird ganz stumm. Wird wie eine Burg so fest. Gott, der über alle wacht. Wie in Hofes eitlem Schwarm. Sicher ruhn in deinem Arm. In the crimson evening light. Looks around on the cliffside. And becomes as strong as a fortress. That might attack you whilst you sleep. Nor the vain crowds at Court. We may rest safe in your arms. C-7(32-35) dated on the first page 22 Aug 1908 and on the third page 22 Aug.